Kelly KBS programmable BLDC motor controller provides efficient, smooth and quiet controls for electric motorcycles, golf carts, go-carts, as well as industry motors speed or torque control. Motor speed controller uses high power MOSFET, PWM to achieve efficiency 99% in most cases. Powerful microprocessor brings in comprehensive and precise control to BLDC motor controllers. This programmable brushless motor controller also allows users to set parameters, conduct tests, and obtain diagnostic information quickly and easily. • Up to 40,000 electric RPM standard. Optional high speed 70,000 ERPM. (Electric RPM = mechanical RPM * motor pole pairs). •Controller supply voltage range, PWR, 18V to 90V. •Configurable battery voltage range, B+. Max operating range: 18V to 45V. •Analog Brake and Throttle Input: 0-5 Volts. Can use 3-wire pot to produce 0-5V signal. •Reverse Alarm, Meter: <200mA. Main Contactor Coil Driver<2A. 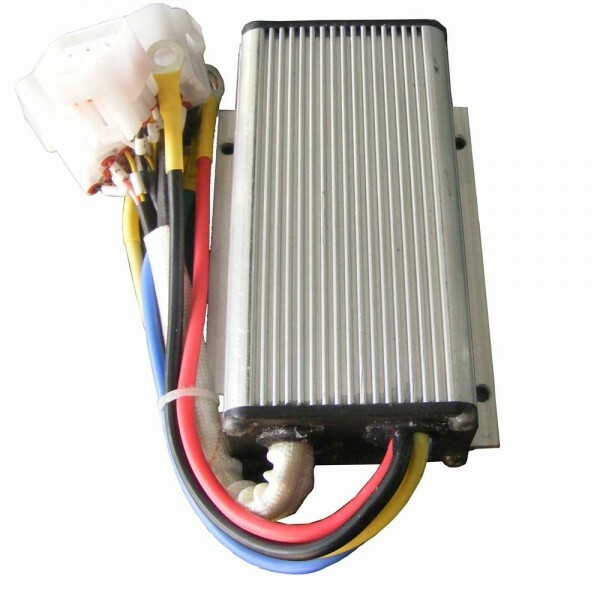 •Full Power Operating Temperature Range: 0℃ to 70℃ (MOSFET temperature). •Operating Temperature Range: -40℃ to 100℃, (MOSFET temperature). •Motor Current Limit, 10 seconds boost: 60A. •Motor Current Limit, continuous: 25A. Provide free male or female connectors matching with KBS controller. X:The enhanced version of KBS-L.